I am really quite the fan of yours, and always love reading your posts. You are one of the biggest inspirations for me starting to wear vintage fashion on a day-to-day basis – not every day, but most days, and just gently, with some retro 40’s pants that I can wear with any kind of top. But I’m getting compliments, and I love how I feel when I wear them. Thank you so much for your excellent inspiration. I wanted to ask a slightly impertinent question, and I really hope it doesn’t upset you at all – how do you keep your figure? You always look so lovely and I wondered if there was anything in particular that you did, which you could recommend? I should point out that I love your Body Confidence posts, and I think that the best accessory is a smile – your’s is beautiful! On a more personal note, I really struggle to see my own beauty in photos. I’d love some tips on how you choose your poses for photos, and on how to be more comfortable in front of the camera. I really do love your blog, and I’m always so happy when I see a new post appear in my email Inbox. All the best to you. Thank you so much for your kind words and support! I will never get used to being called a inspiration, it is truly humbling. I take no offence and your question about my figure. I’ll be honest with you, I would not say that I am a good role model for eating habits and exercise. I am lucky enough to have been blessed with a curvy shape but I would not say that I am toned or in good shape. I don’t really exercise which I know is terrible but it can be just so hard to find the time (lame excuse I know). My job is in some ways quite active, I can be standing and moving around the salon without a break for 9 hours so at least I’m not just sitting at a desk all day! In the summer, my husband and I go out for walks which is great and now that the weather here in Auckland is less dreary and it doesn’t get dark till late, we will probably start getting back into that. I also used to do the Insanity DVD workouts which were pretty amazing! Regarding my eating, it can be pretty up and down. I have a major sweet tooth so there always has to be chocolate in the house. I love having a bagel with salami, feta, tomato and avocado for lunch, breakfast is either porridge or my fathers homemade fruit bread and dinner can be a wide range of things. I’m a shocker for my vegetable intake and will be the first to admit that I could definitely improve my eating habits! My biggest issue is being organised and having adequate food at work. If I’m fully booked all day, I might not get a proper lunch break so I try to have lots of snacks that I can munch on while I’m mixing up colour. I certainly don’t have one of those metabolisms that keep me from putting on weight, I guess what stops me from putting on more is that I try to stop eating when I’m full (most of the time!) and sometimes I just am too busy to eat… which is definitely not a good thing! With this all said, I don’t think I’m the right person to recommend anything in particular for maintaing weight. I guess what I can say is that my mantra I try to stick to is everything in moderation. I don’t believe in cutting out carbs or whatever else seems to be on trend… in my experience, that just leads to bingeing! Georgina of Fuller Figure Fuller Bust is currently on a weight loss journey and sets an amazing example of healthy eating and exercise regime. Follow her progress on her Facebook Page if you are not already! I’m sorry I don’t have a magic equation for you but I figure honesty is the best policy! This is something that I know I can improve on and be more proactive about. Eating healthy and getting regular exercise has been a lifelong issue. I think with whatever you do, focus on the long-term goals, not the short-term. My friend Jessica spoke about nutrition at my ‘Mirror, Mirror’ Body Confidence event- you can find key points from her talk in this blog and they are really interesting! Hope that in a small way, this may have helped you! Regarding the second part to your question about posing and confidence in front of a camera, I will endeavour to answer that in another post soon! 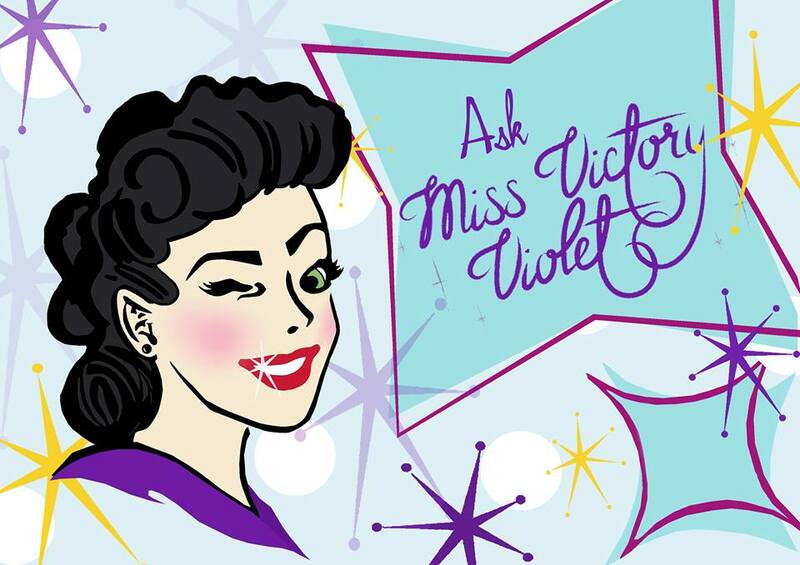 Submit to Ask Miss Victory Violet here! I just wanted to say thank you – to Jessica for echoing exactly the thoughts and questions that I have and to you for replying so candidly and with such a helpful referral to Fuller Figure Fuller Bust. Oh my gosh, you answered my question! I’m so amazed! And delighted! Thank you so much for your honesty in your answer- it’s good to know that I’m not the only one who thinks I can improve my healthy eating and excercise! My own watchword is balance- similar to moderation, it’s not about strict rules or denial of pleasure, just keeping everything in balance. I will certainly be checking out the other blogs you mentioned, thanks so much for the recommendations. And I look forward to more information on posing for photos! I’m trying a little experiment where I take a photo of myself every day- it gives me something to dress for, even if I’m not leaving the house, and I can get a good look at how I look! Thanks again, for the answer, and for everything.